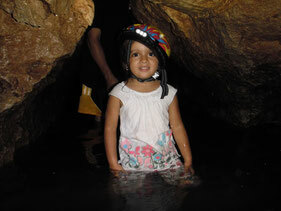 Venado's Caves at forty-five minutes minibus ride from La Fortuna, is waiting for you to discover it. Are you ready for this exciting adventure? 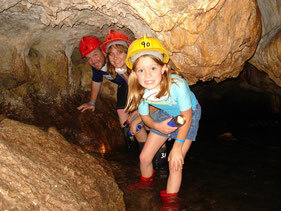 Accompanied by a tour guide, you will begin this underground journey deep into a 1.5 miles system of caves well kept in its natural state where it is possible to observe stalagmites formations. Sometimes visitors may walk comfortably, while other times you might crawl or wade like a snake. You will reach and pass through a certain point where a 5,000-year-old rock formation is located. This formation’s physical make up is the result of two different types of rocks and due to its shape; locals have named it “La Papaya”. Within this underground system, it is most likely you will encounter water flowing so be ready to get muddy and really wet. 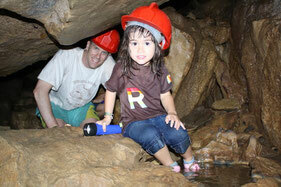 The trip inside of the Venado Caves might take from 1 1/2 hour to 2 hours. This will allow you to visit some of the 10 underground chambers. Walking through these subterranean passages are safe and with the help of a lantern, you will the possibility of observing some of the species endemic to this underground habitats. Note: Bring extra dry clothes to change. Please send a message if you want to make reservation or if you need any extra information about the Venado Cave's tour.